Stream movies, TV, audiobooks, ebooks, comics, or music to your computer or mobile device. hoopla is the library’s streaming media service. As long as you have an internet connection, you can instantly view movies or television episodes, read ebooks or comics, or listen to audiobooks or music albums. 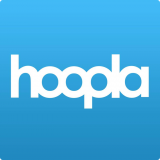 Note: You must create an account with hoopla before using the app. Please ask a librarian, call the library at 444-5336, or come in and see us if you have questions.